Man in the Ramganj area of Jaipur in Rajasthan, India. When Kristian Bertel was photographing in the Badi Chopad area of Jaipur he was among many of the city's people. Like the picture of a seated man in the Ramganj area of Jaipur, which was captured in a passing moment in one of the main streets in the Ramganj area in Jaipur. The picture of the man you see in this blog post is pictured in Jaipur. Jaipur is the largest city in Rajasthan and was built in the eighteenth century by Sawai Jai Singh as India's first planned city. Jaipur is a major tourist attraction amongst Indian as well as international travellers. It belongs to the tourist Golden Triangle of Delhi, Jaipur and Agra. When Kristian Bertel was photographing in the Badi Chopad area of Jaipur he was among many of the city's autorickshaws. Some autorickshaw drivers will tell you to buy artifacts and gifts from some shops especially some located on way to Amber fort. Firmly refuse to stop there as these shops operate on commission to the auto driver and fleece you. If you've got to buy some souvenirs buy them in city's main shopping areas like Bapu Bazaar. Take along some of your own information about the eating and shopping places as the drivers have their fixed commissions at shops and eating outlets, so you might end up paying more for and item or eating at an undesirable place. Kristian Bertel's Badi Chopad picture collection is among the thousands of pictures which was taken during his first India journey. Badi Chopad pictures that reflect an area in Jaipur as a city in India. On this journey, he has focused on the life in the city of Jaipur, with stories from the everyday life of the inhabitants of this pink city. His pictures often caried out in portraits of people show a diverse culture of India. With the telling portrait in focus, the photographer's work consists of pictures that tell a story. "- I'm also on the lookout for the sad faces just as must as the smiles when I take pictures. My great interest in photography is to find the human stories behind the people I'm taking pictures of, seeking out their own personal life stories from the expressions in their faces", the photographer says. His most recent photographic work is portraying the life in the Badi Chopad area of Jaipur, India, where the photographer explored the streets of Jaipur. As he did with his earlier with his telling pictures he tells stories with dedicated portraits of a sometimes hard life in India. Kristian Bertel is working as a portrait photographer and he is available for editorial and travel assignments all over Europe, Asia, Africa and in the Middle East. He work of the photographer has the purpose to capture different faces of the country of India. 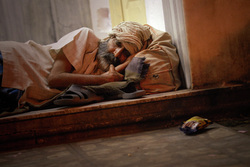 His intention with his Indian series is to report on conditions in India, seen through an eye of a photographer. If you are interested to see more pictures and imagery from India, you can see one of the slideshows, which also appears on the photographer's website.